This page updated 14 August 2013 with more information on ammo. boxes. In the late 1980's a Vickers machine gun (mg), with tripod and transporting box could be bought for £300.00, the price today?, I searched the web in July 2013 and didn't find any Vickers .303's for sale in the UK. So, guessing, I would say between £1,500 and £2,500. These prices are for the more common Vickers but would increase if it was an early one or, perhaps, not many of a certain type were made. The Vickers mg is a heavy mg (HMG) in many ways. With a water jacket around the barrel and a 2 gallon water vessel\can attached meaning it could continuously fire for many minutes without overheating. The Vickers could fire ordinary .303 ammunition or 'Z' high power ammo - the 'Z' should not have been fired in .303 rifles because of barrel wear but, it was! 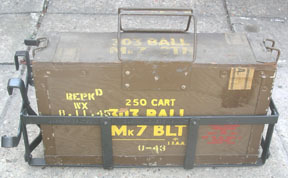 - it's nice to get the ammo box with 'Z' on it. The Vickers is also physically very heavy and it's better to get two people to lift it onto the Champ. 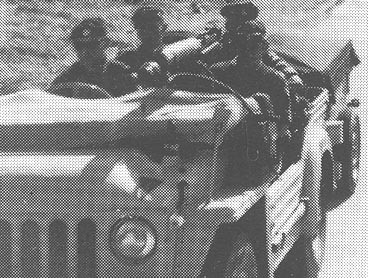 The mounting position through the scuttle is the standard position but it is known from ex-servicemen in Korea and photos that mg's were mounted behind the front seats of the Austin Champ. The film, The Magnificent Two shows a Vickers mounted this way. Mounting on an Austin Champ. The greeen post shown below is specific to the Champ/Vickers .303. This one is, I believe, an original although it has no part number on it. I have not heard of any reproductions ever being made. 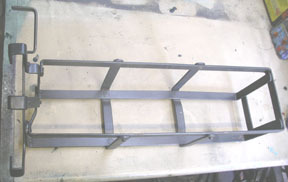 There is a threaded hole near the top that matches the slot on the next mounting so that the gun does not jump out of the post over rough terrain but still allows the gun to be swivelled. 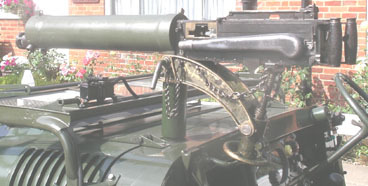 A difference between the Vickers and Browning posts is that the Browning post has an extra threaded hole with a bolt that can be hand tightened and stops the gun being swivelled, which would be useful so the gunner does not have to continuously hold the gun while the vehicle is moving. The mounting below is standard and fits the Vickers tripod. I have never seen this piece for sale on its own and a I would think a complete tripod would need to be bought. In 2013 the price could be well over £500. 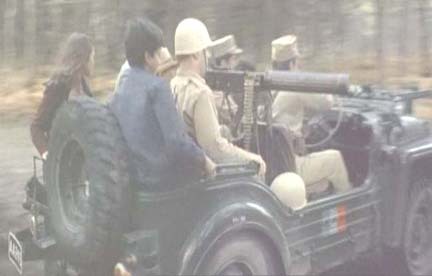 If I was trying to mount a Vickers today, and considering that it may be nearly impossible to obtain the original mounting, shown above, I would take any post and consider making a mounting like the one in the film, The Magnificent Two, shown below, which should not be too difficult to make. 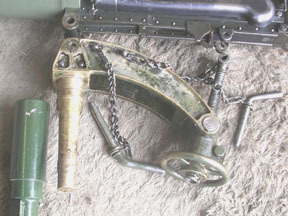 The following in-service photo shows the Vickers mounted in the back or, put it this way, it is not mounted on the scuttle mount. 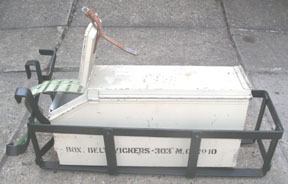 The water can for cooling is mounted on the nearside wing. 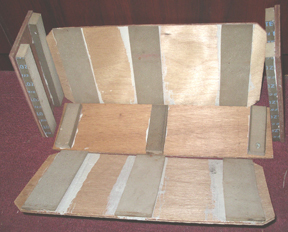 Ammunition boxes: the next photo shows a wooden* ammo box - the red writing bottom right says, "This ammo is not to be used in the Browning mg."
The next photo shows a metal Vickers ammo box which goes in the cradle but does not fit it as the wooden one does. 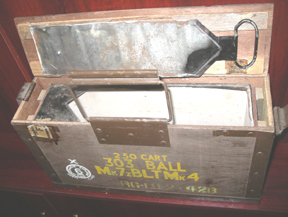 *The ammo inside these boxes was sealed in a metal container and it is rare to find a box with the container still in it today but I did find one in America, which is marked for 'Z' machine gun only ammunition, it has the original sealed tin box and because the tin box is smaller than the wooden box there are purpose-made plywood and foam packing pieces. 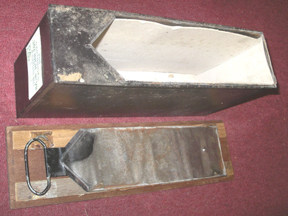 The tin was originally sealed and opened by pulling on the lid handle - on this one the handle has been fixed to the wooden lid for display. The paper inside the tin box is like thick blotting paper. At shows I have seen blank-sided cans with Valor on the bottom but often the stall holders didn't know they were Vickers hmg cans. A word of caution with these cans: this can is 70 years old and these cans may look OK and even not leak when first filled with petrol but may spring a leak some time later, as happened to me. 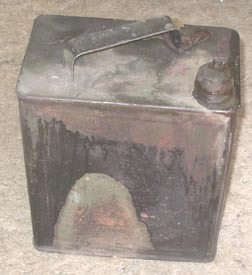 I am having the two cans I have lightly shot-blasted to check them and if they don't pass the test then marking them, 'for display only' - in the last photo, June, 1943, this can is more rusty but will still hold petrol but not safely.